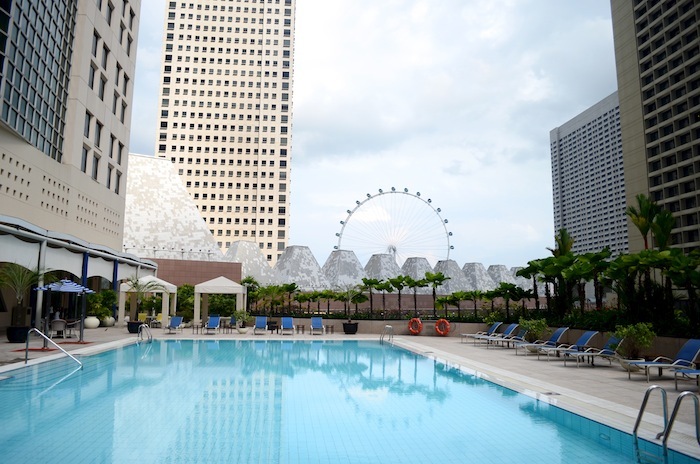 Last weekend, I had a nice staycation over at Conrad Centennial Singapore and had a wonderful break from work. The room we booked was spacious, luxurious and the floor-to-ceiling windows gave us a view of the pool a few storeys down. Here are some pictures of the hotel and some words on my experience. Our fluffy beds, side by side, facing the huge window. A work desk for the ever-so-hardworking blogger like me. I spent some time writing an article for a magazine here. Felt like I was a living Carrie for a while – without the Jimmy Choos, of course. Lots of exciting stationery! Included things like the hotel-branded cards, postcards, letter paper, envelopes etc. And if you aren’t in the mood for writing, you can always read. The mini bar area., where there was complimentary coffee and tea. The cups were porcelain, not like the disposable ones in some other hotels. Welcome to my favourite part of our room – the bathroom. You bet I spent some time in here just soaking and reflecting on life. You know, like what they do in movies. Some bath salt and a rubber ducky to play with! On hindsight, I realised I had never played with one prior to today. Toiletries packed nicely by the sink. The little glass bowl contained all things cotton (buds, pads, tufts…). Glasses for toothbrushes and facial tissue. The TV area crowded with our stuff (and takeaway lunch from a library cafe). There were quite a few cable TV channels, like HBO and DW. The curtains gave us privacy when needed. But most of the time, we regaled ourselves watching hotel guests at the pool below. The view from our window. That’s the Central Business District in the far background. I suppose they call this upscale living? My BFF came over and we made our way to the pool for a short while, before lightning came and shoo-ed all of us away. That’s part of the Singapore Flyer. View of the hotel from the pool area. Because it was my sister’s birthday, Conrad Centennial Singapore presented us with a complimentary birthday cake! Thank you, Conrad! Our staycation package included a buffet dinner and breakfast-for-two. I didn’t take any pictures of the food, but it was definitely worth our tastebuds. For dinner, I suggest you try their salad bar and their popular laksa even if you aren’t the type who likes spicy food (like me). Indulge in the super fresh sashimi and delectable pastries (I loved the apple crumble the most). For breakfast, the scrambled eggs were a bit dry, so you can probably skip that, but I loved the local fried beehoon and French pastries, such as croissants and pains au chocolat. My BFF, Corinne, popped by and we both went for a spa session each at the Centennial Spa. After the spa, we were given some sweet warm tea (tasted like ginger and red dates) while we sat around and chatted for a bit. It was a relaxing experience and I’d like to go there again if my budget allows it. Two days and a night is too short, in my opinion, for a spa staycation at Conrad Centennial Singapore. Another night would have been better for us. Although check-in takes pretty long, the service there is excellent and the location is pretty convenient. The night we were there, I bumped into Jimmy Cliff and his entourage! Maybe next time I’ll meet someone else who’s famous. Looking forward to my next stay at Conrad. Staycation: Conrad Centennial Singapore was last modified: March 31st, 2013 by Roxanne C.